In the ruins of the Native American city Cahokia, which flourished hundreds of years ago, there is a burial mound with the remains of a royal or noble couple. Buried around them in the mound are the skeletons of many people who were brutally chopped up, strangled or bled to death in apparent sacrifices. The “beaded burial” at the center of Burial Mound 72 was previously thought to contain bodies of six highly important men. But a new study concludes that some of the 12—not six—high-status skeletons include women and one child. Buried at the very center of this central beaded burial feature is the couple—that is, a man and woman. The press release does not make clear whether any of the 12 people in the beaded burial were sacrifice victims. The burial mound was used from about 1000 to 12000 AD. Inside the burial mound, rediscovered in 1967 by archaeologist Melvin Fowler, were five mass graves with between 20 to more than 50 bodies. Many of them were sacrificed. The mound is also called the “beaded burial” because two of the bodies at the center of the grave contained two bodies on a bed of luxurious beads. Dr. Emerson conducted a recent study with anthropologist Kristin Hedman and skeletal analysts Eve Hargrave, Dawn Cobb and Andrew Thompson. The results of their research have been released in an article in American Antiquity . They say that Fowler and other researchers erroneously concluded the beaded burial was of two high-status men who were buried with their servants. They thought the beaded cape or blanket was in the shape of a bird, which are symbolic to warrior societies and mythology in Native American culture. A fresh look at the early archaeologists’ maps, notes and reports and the skeletal remains told a new and surprising story. First, the researchers found that there were 12 bodies associated with the beaded burial – not six, as had been previously reported. And independent skeletal analyses conducted by each of the co-authors – Thompson, Hedman, Hargrave and Cobb – revealed that the two central bodies in the beaded burial were actually male and female. Further analyses revealed other male-female pairs on top of, and near, the beaded area. Some were laid out as fully articulated bodies. Others were disarticulated bodies, the bones of which had been gathered and bundled for burial near these important couples. The researchers also discovered the remains of a child. Researchers had speculated that victims of human sacrifice found at Cahokia were brought in from outside the area, perhaps as tribute. But an analysis of the element strontium in the victims’ teeth shows they were mainly local—especially the 39 people brutally killed and unceremoniously dumped in a mass grave. As Ancient Origins reported in 2015, Mound72 had groups of people, some of them victims of sacrifice, buried in large pits. Many are laid out in neat rows and had little sign of trauma. Researchers speculate they died of strangulation or blood-letting. 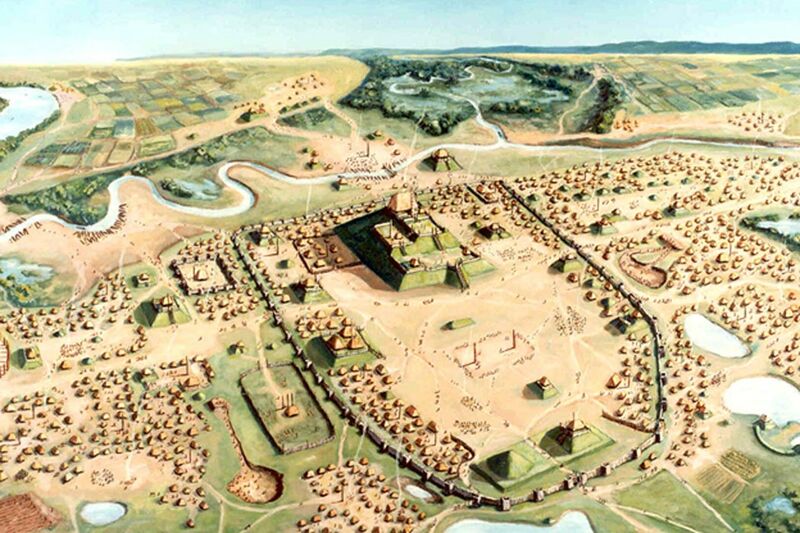 From about 700 to 1400 AD, Cahokia was apparently one of the biggest cities in the world. At its height it had 15,000 residents. The complex society at Cahokia, part of the Native American Mississippian Culture, prospered in the fertile lands off of the Mississippi River across the river from modern St. Louis, Missouri. The University of Illinois press release has links to the American Antiquity article and other recent articles relating to Mound 72. The Rise and Fall of Cahokia: Did Megafloods Spell the End of the Ancient Metropolis? Read more about The Rise and Fall of Cahokia: Did Megafloods Spell the End of the Ancient Metropolis?